A very golden smile receives us in most places in Uzbekistan. It’s considered fashionable and symbolises the wealth of the Silk Road.Bukhara, Samarkand, 2 names equivalent to the Silk Road, to the Tales of 1001 Nights and the dreams of these ancient traders sneaking with their camels charged with purest silk from China’s Xian to Othoman’s Constantinople. Mix this with the former people’s owned Soviet reality and some current Uzbek perfection of all of this – and you get the heart of Silk Road. Another morning with blackish clouds and even some raindrops in Khiva. Breakfast and a long chat with Tricia and Gary, Australian backpackers. Currently, on their way to Iceland. There are more important sights near Khiva. We drive some 100km to visit the Khorzem Qalas. Old desert forts dating back as far as the 4th century. On the way we cross a Landcruiser with an Austrian number plate. We stop. 2 guys come over asking us if we’re Monika’n’Martin. We’re slightly astonished. How the hell do people know our names just by passing by. Maybe a new app on their phone – or just some police guys knowing us because of our unlawful driving. Well the secret was quickly solved – they’re Ute and Thomas – we’ve been mailing for quite some time. They rather recognized Prado than us. A quick chat, the rest we postpone. We visit 2 of these desert forts. Definitely it’s visible they are a little aged. We can still imagine there was a construction some 1500 years ago. Nevertheless, with all imagination it’s difficult to visualize all the magnificence of these structures. Being not a professional archaeologist, to us they resemble rather to huge mud heaps. Sorry guys. On the way back to Khiva the wonder happens: Prado gets a refill at a real petrol station. 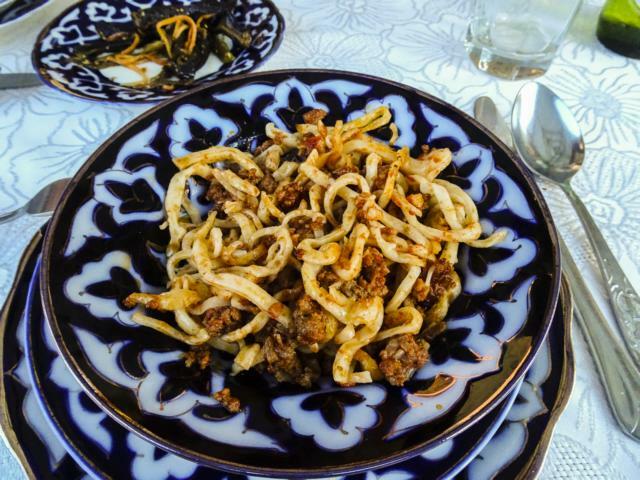 And we get one of those sumptuous filling Uzbek dinner – finally a kind of spaghetti Polonaise we have been searching for such a long time. Accompanied by plenty of cold beer and good company. Exchanging tales from countries far away from Uzbekistan. 450km to Bukhara. 6h; half on a pretty bumpy road, half on a brand new highway still being partly under construction. Along the Turkmen border, then thru desert landscape. Not really the most interesting trip. We suppose to avoid drivers to fall asleep they place quite a number of real or fake police checks. And the next wonder shortly before entering Bukhara: diesel at the station. No problem. Bukhara – probably the most famous town of the ancient Silk Road. To adapt to this we have to choose the correct accommodation: Komil GH. A building in the old town with real ancient, beautifully decorated rooms. A wonderful place not to be missed. The town is quite different from Khiva. The former more like a museum; all concentrated on a few streets. Thus easy to imagine the great past of the town. 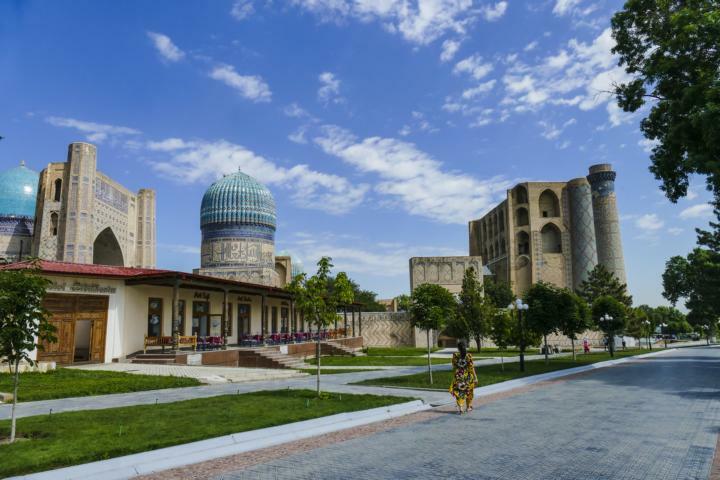 In Bukhara the famous places telling of its importance for the ancient Silk Road are much more spread within the city’s center. Therefore, some mix of these old buildings, some remaining Soviet style structures and some of this architecture locally considered fashionable. 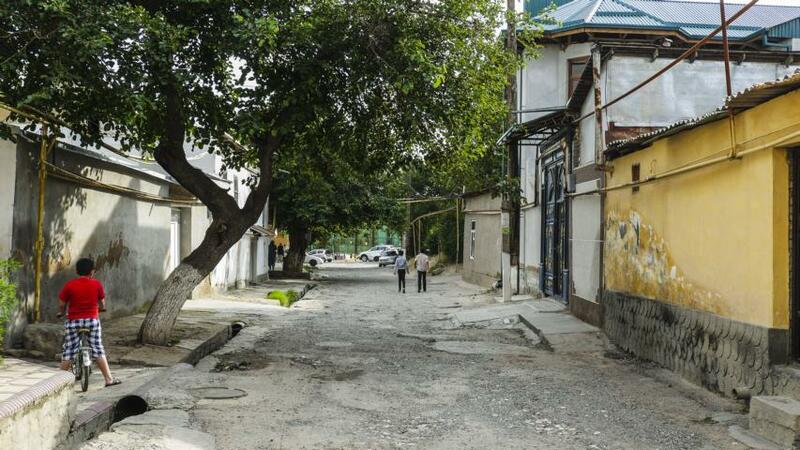 Understandably many tourists visit Bukhara. Where else can you buy such a lot of souvenirs – and still see all these delightful ancient buildings you only imagine by reading the Tales of the 1001 Nights. 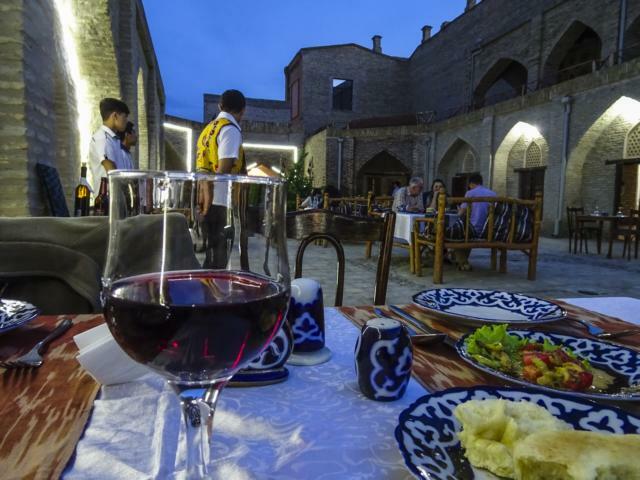 … or an excellent meal with a glass of rotten Uzbek grapes – by the way, with a definite potential to perfection. To Samarkand. 5h on a rather bumpy “highway”. The landscape changes considerably. No more desert or steppe; all irrigated fields – a clear sign where the missing conflux to the Aral Sea has gone. 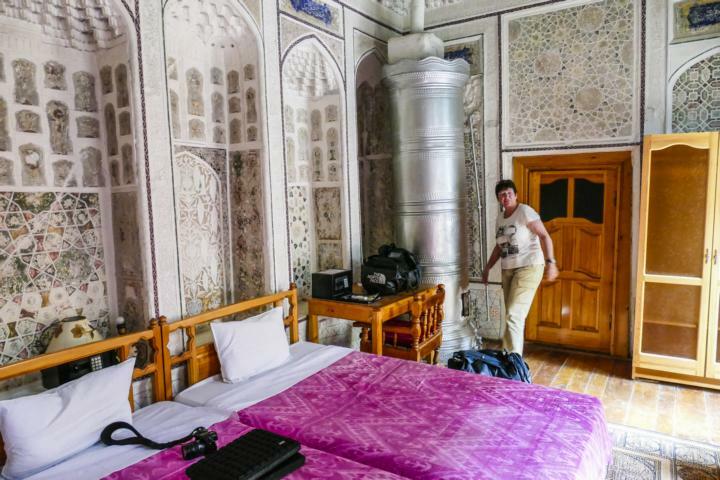 Samarkand – very different to Bukhara. A considerably bigger town, largely absolutely nondescript with a few islands resembling again to the Tales of 1001 Nights. At the famous Registan some uniformed guys try to offer us an entrance fee reduced by 25% if we wouldn’t need the ticket. But we want a ticket. The guy seems to be slightly unpleased. Of course endless opportunities to admire the buildings, to take all the pics 100 000 tourists have taken before us. Nevertheless, all seems to be in a rather aggressive atmosphere with security guards constantly shouting at some people, souvenir sellers haggling for clients and everybody busy to see all sights as quickly as possible. Whatever, maybe just a sign of too many people having admired the place in the last years. Next day some more mosques and mausoleums – all beautiful buildings, but not really animated. Then a visit to the Avenue of Mausoleums. Awesome buildings and an atmosphere absolutely opposed to the other must-have-seen-sights. An amazing place with lot of pilgrims – probably because it’s Friday. And finally – the astonishing difference of the very same house at a main street: seen from the front and the back side. After all these sights in Samarkand a change. 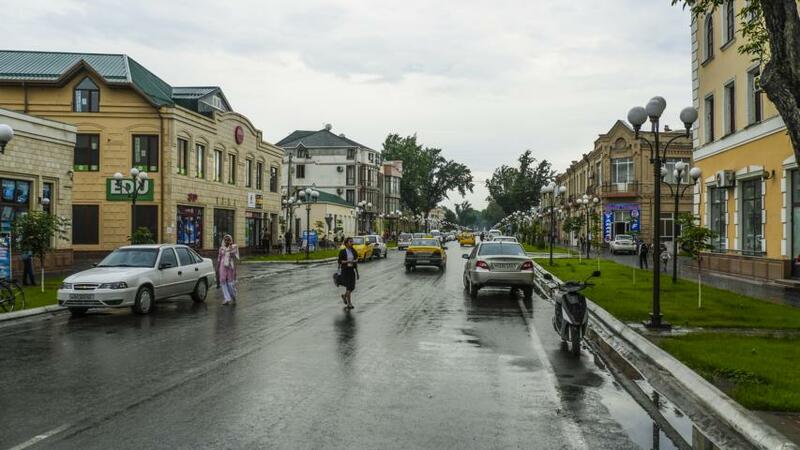 We take the mountain road to Shakrisabz the home town of Uzbek’s national hero Amir Temur. For those who don’t remember everything they had to learn in these school days passed long time ago simply go to https://en.wikipedia.org/wiki/Timur. The town some 90km south of Samarkand, the road definitely special: after 7000km, for the very 1st time we drive over a mountain pass. What a difference to see the world from 1800m above sea level. Shakrisabz a rather small, characterless town with the exception of the huge park being constructed in honour of Temur. About 2km long, flanked by newly built, currently representative buildings on both sides and a lot of fountains in the middle – all to honour their great hero and to improve nationalism. 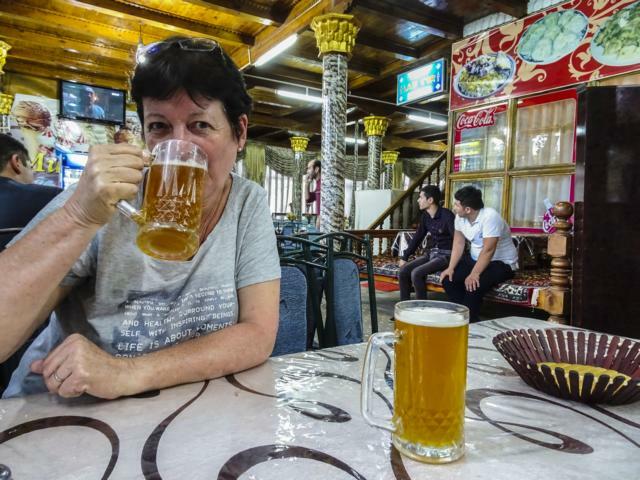 After all these adventures a last beer in a rather rustic bar in Samarkand – and the next day we’re off to Tashkent, the proud capital of Uzbekistan. The road some 350km; as usual rather bumpy. Lots of traffic and many villages to drive thru. About 5h to arrive. We search an accommodation for us and a safe place for Prado. First some inconsistencies to clarify. It seems most hotels and GHs are quite under pressure to comply with whatever rules apply for the moment. Complicated. All prizes mentioned in $ are at least the double of whatever was known to us before. Nevertheless, these $ prizes have to be paid in local Som. $ are no longer accepted, except if paying by credit card. Didn’t understand? – never mind, nor did we. Finally we agree on the prize published in booking.com, to be paid by card. Now time to check-in? – of course not. Now it’s the opportunity to question the tourists begging for a room (in other places they’re called customers) about their former registration papers at other hotels (an all important measure of the government to control good behaviour of tourists). Then the opportunity to park the car properly, proof that you’re married and finally all formalities finished. You’re in. 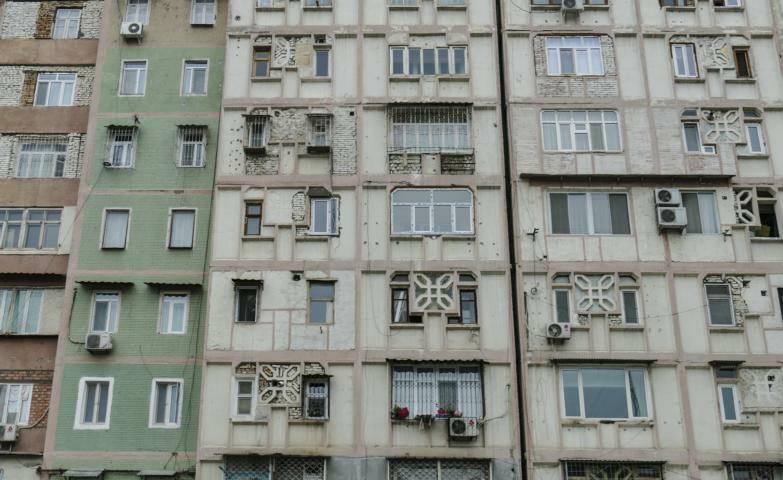 Tashkent, not really a place with many top sights. Neither it demonstrates the majestic grandness of a real Central Asian capital, formerly established under peoples owned Soviet rule after the disastrous earthquake in 1966. But still keeping a strong feeling of the former Soviet era atmosphere. … some journeys on the marvellously decorated metro, a look at the rather decrepit housing estates everywhere in town and a nice dinner in a real Russian restaurant. And that’s it. Initially we have planned to spend a day in a mountain resort near Tashkent. Unfortunately, again the weather does not really encourage this. It’s raining – nonstop, the whole day long. So we head for Kokand some 200km away in the Fergana valley. Only 1 single road connects Fergana with the rest of Uzbekistan. All other roads pass thru “hostile” neighbouring countries. 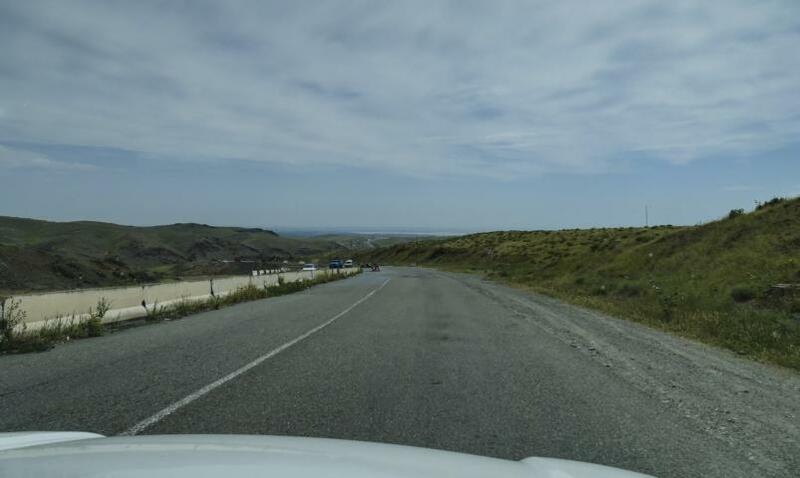 As Fergana is considered a sensitive area due to its recent history the road leading over a pass of 2200m is heavily secured. Anyway, there’s not much to see in the rain and fog except a continuous construction site. …and 1 of the most glittering royal residences of a local despot – wikki it at https://en.wikipedia.org/wiki/Muhammad_Khudayar_Khan. We take the opportunity for a rather wet visit. The next day the short trip to Fergana. The town itself absolutely unremarkable. But just a short distance to Margilon and its famous silk factory. Visitor get explained all steps of silk production, can watch the workers producing the material and finally – of course they have the huge opportunity to buy whatever has been produced in the factory. The other attraction one of the biggest and most famous markets of the Silk Road: Qum Tepa. A paradise for Prado – not a single spare part that is close to a car’s heart is missing there. Mostly very used, but it surely has proven its quality. Of course, again a lot of silk and other material and many people to exercise our Russian. So far our adventures in Uzbekistan. Tomorrow we’ll head for Kyrgystan. We’re convinced very different challenges are waiting for us.